Pheasant rooster along a fence. Iowa’s pheasant hunting season opens this weekend with predictions that hunters will have a hard time spotting birds. Todd Bogenschutz with the Iowa Department of Natural Resources says preseason counts of pheasants are behind last year’s near record low figures. Hunters could face additional difficulties this weekend because birds have so much cover. “It’s going to be challenge this opener with the amount of crops we have standing,” Bogenschutz said. Monday’s crop report showed only 12% of the corn and 47% of the soybeans in the state had been harvested. Steady rains have kept farmers from getting their combines into the field. The decline in Iowa’s pheasant population is blamed in part on two consecutive harsh winters and the record flooding of 2008. Bogenschutz says there were still around 86,000 hunters combing Iowa farm fields last year. “We’ll probably see a similar number of hunters this year,” Bogenschutz said. Depending on the location of the field, some hunters will likely have better luck than others this weekend. Bogenschutz say pheasant counts are down in the northern third of Iowa, but up a bit in the lower two-thirds of the state. 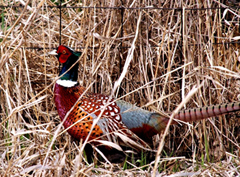 Another factor in Iowa’s declining pheasant population is a loss of habitat. 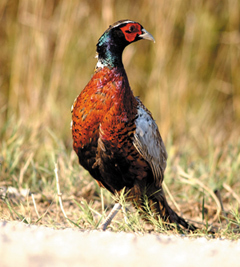 According to the D.N.R., in 1990, Iowa had 8,500 square miles of suitable pheasant habitat. That shrunk to 5,800 square miles within 15 years. Bogenschutz says a legislative task force is looking at various strategies to improve upland game numbers. The group’s recommendations will be delivered to lawmakers in January. Photos by Lowell Washburn, D.N.R.